My husband's favorite color is green. So when this quilt started taking a decidedly green turn, I decided it would be for him. The wedges are made using a 15 degree ruler from Creative Grids. The gradated fabrics came from MassDrop. There are more colors in the set that I didn't use. We'll see how they show up in future projects. The white background fabric is covered in mathematical figures and equations, including many different shaped triangles. Perfect for my hubby--he has degrees in both math and physics. 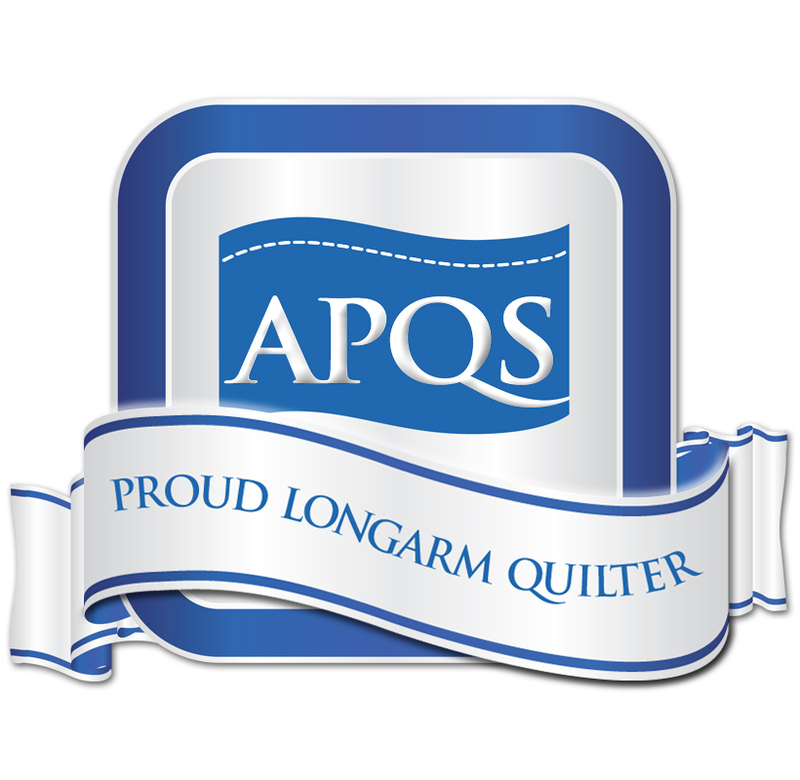 I custom quilted it on my APQS Freedom longarm. 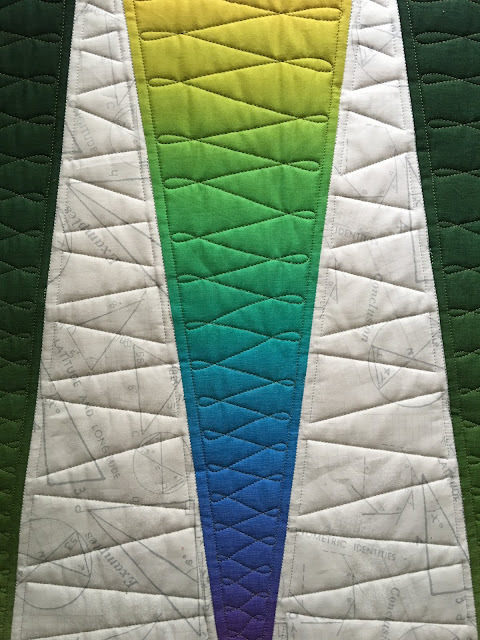 I love doing figure 8 quilting and did all the gradated sections with that first. Then I went back and quilted the background sections with triangle shapes, using a ruler. That part took A LOT longer than the figure 8s! The finished size is 52" X 80". 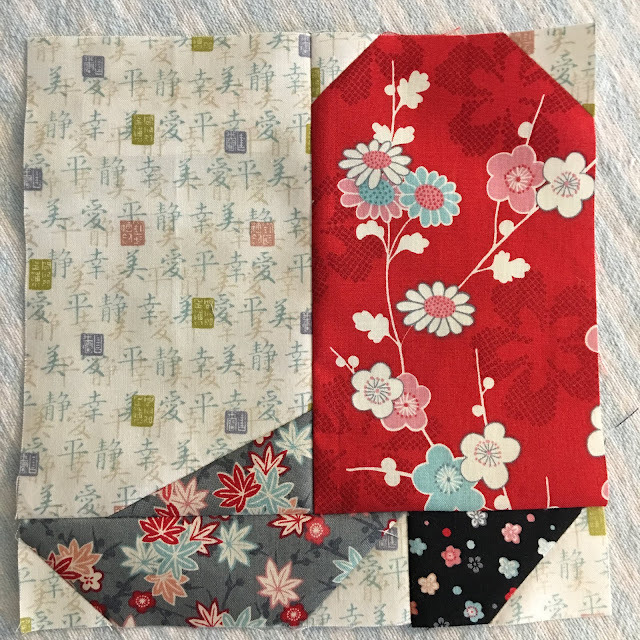 I used Quilters Dream Batting--Orient. It has both bamboo and silk in it. It's super soft, super lightweight and perfect for warmer weather--doesn't get hot. I have it on a roll that is 60" wide, so I make my throws between 50" and 55", to accommodate the batting width. 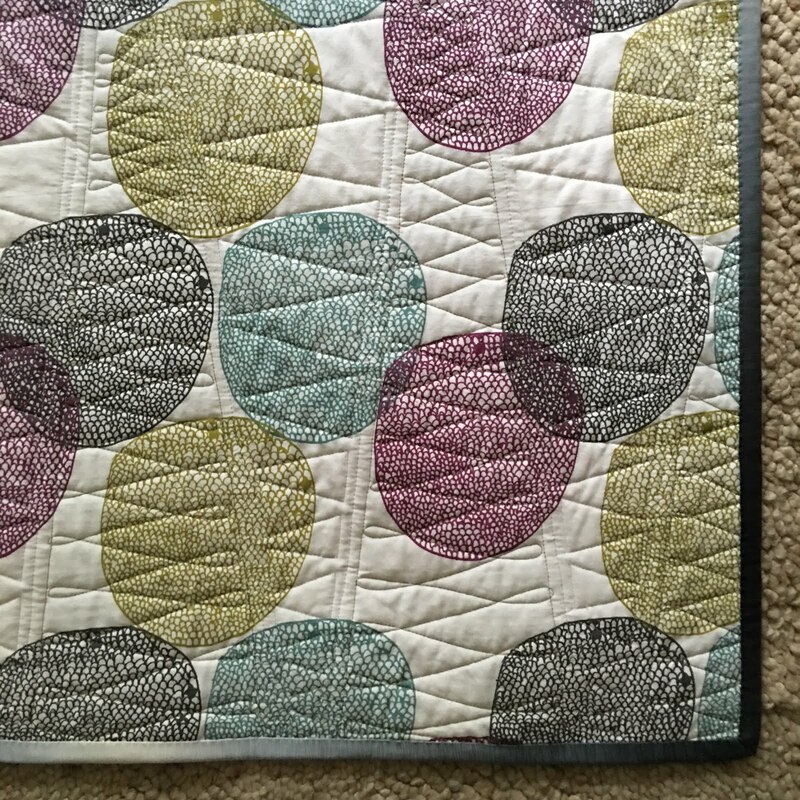 The backing is from a duvet cover--twin size, that I bought at IKEA. It's 100% cotton. I took out all the seams and ended up with enough to back this quilt and another quilt the same size. Plus I took the pillowcase apart and that is enough to back a tablerunner--20" X 68". The duvet cover cost $15. It's a rather mod, interesting fabric. I finished it on our wedding anniversary, June 14th, and gifted it to my DH that same day. It's our 30th this year! We're still having fun!!! 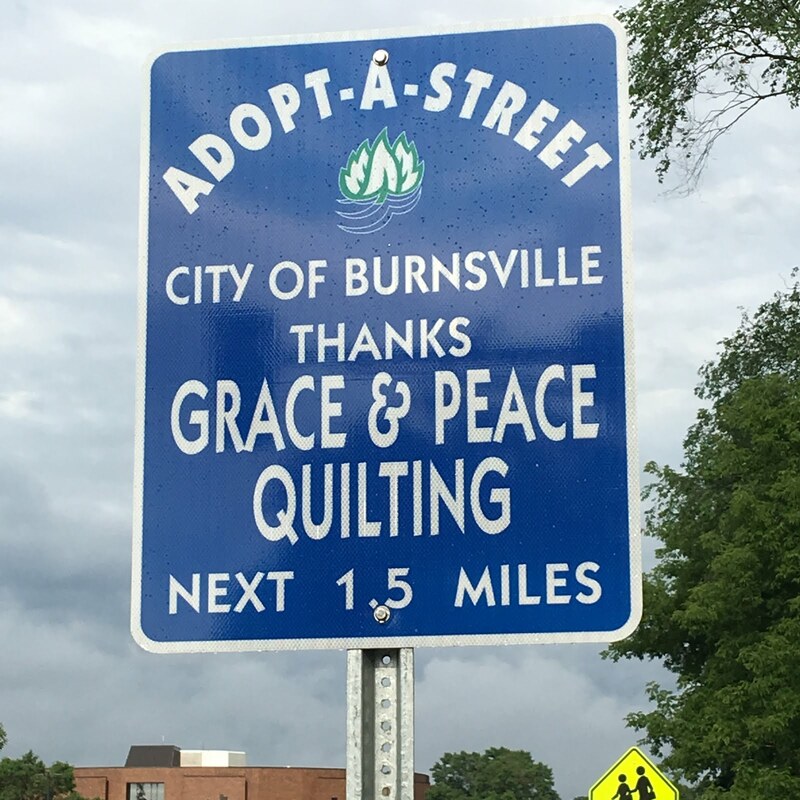 We also had our local quilt guild meeting on June 14th--Dakota County Star Quilters. As a gift to our out-going president, Sandy, we each made this cowboy boot block. 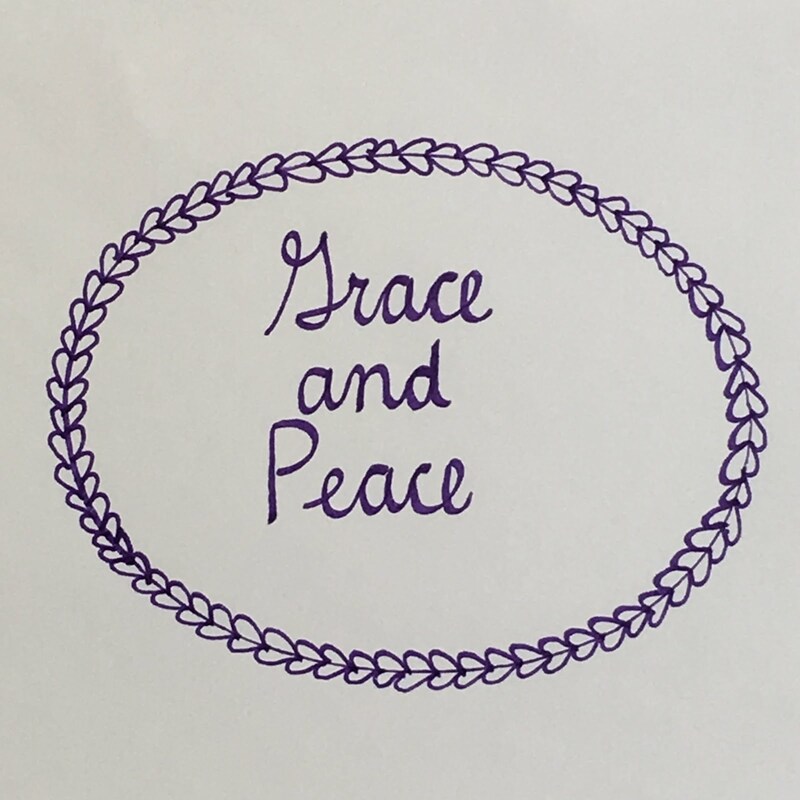 It finishes to 7 1/4" X 7 3/4". I naturally made mine in Japanese fabrics. 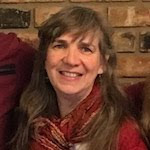 Sandy was our pres for 2 years running and loves to wear cowboy boots. 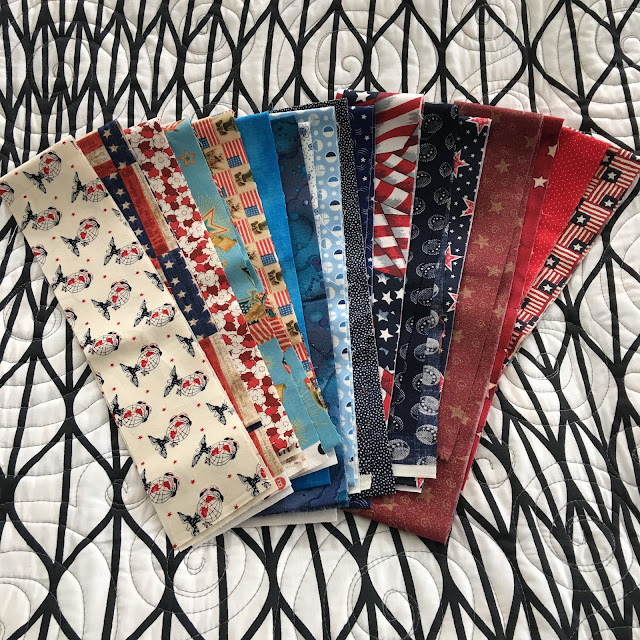 And lastly, we did a 2 1/2" patriotic strip swap at guild, also. Here are the strips I brought home. Looking forward to making something patriot out of these! What a lovely anniversary gift! Congratulations on 30 years! Thank you, Paula! Quilts, like hand knit socks, make great gifts. I love you husband's quilt! Awesome colors. Thanks, Kat!!! It's fun to work with gradated fabrics! The math fabric is perfect. This one is very eye catching. Thanks, Kath! 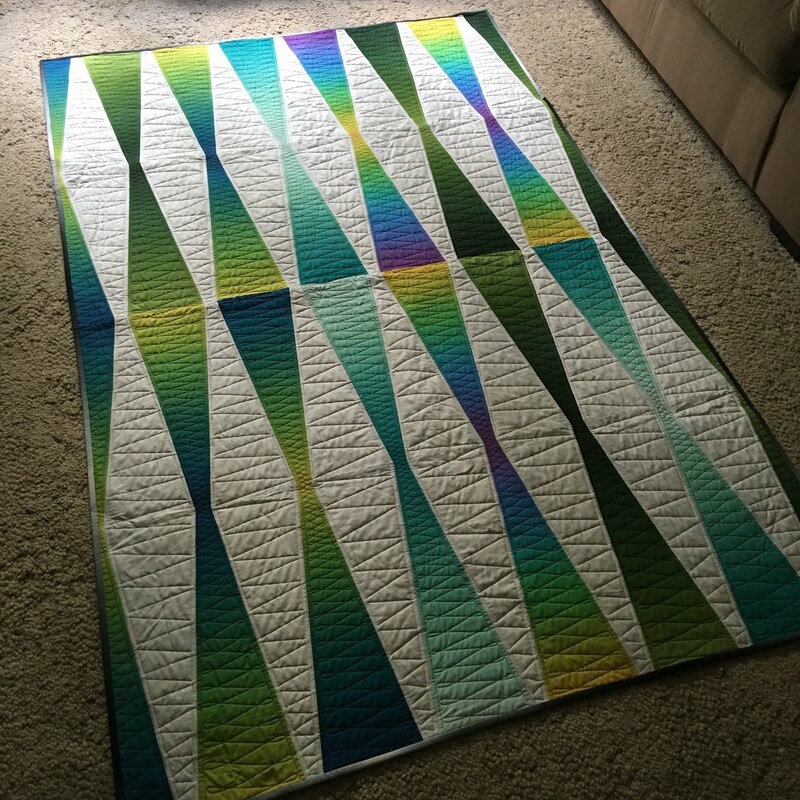 It's a fun quilt to make, with the 15 degree ruler! 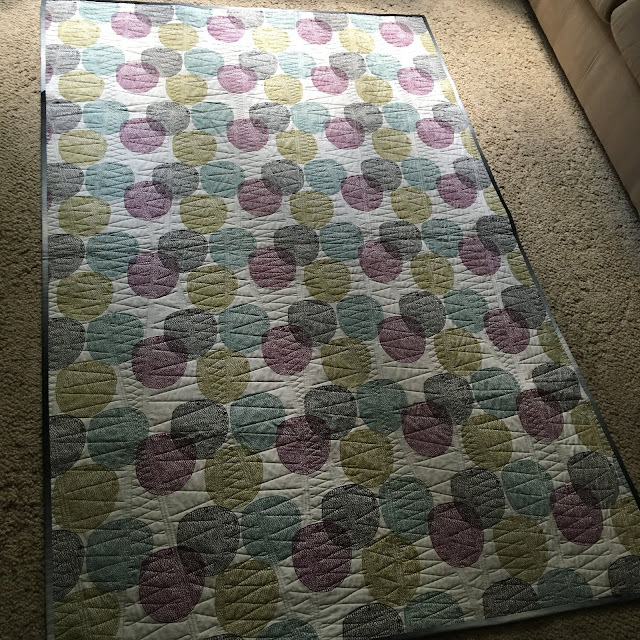 Your explanation and pictures make your quilt look like fun and fast sewing as the pieces are large. 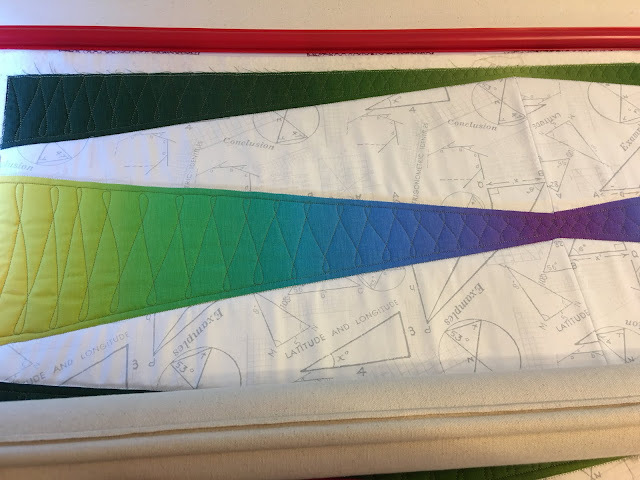 I have not seen math fabric, but I definitely want to find it. I'm sure your husband is thrilled with the gift. Happy Anniversary! Hi Mary! 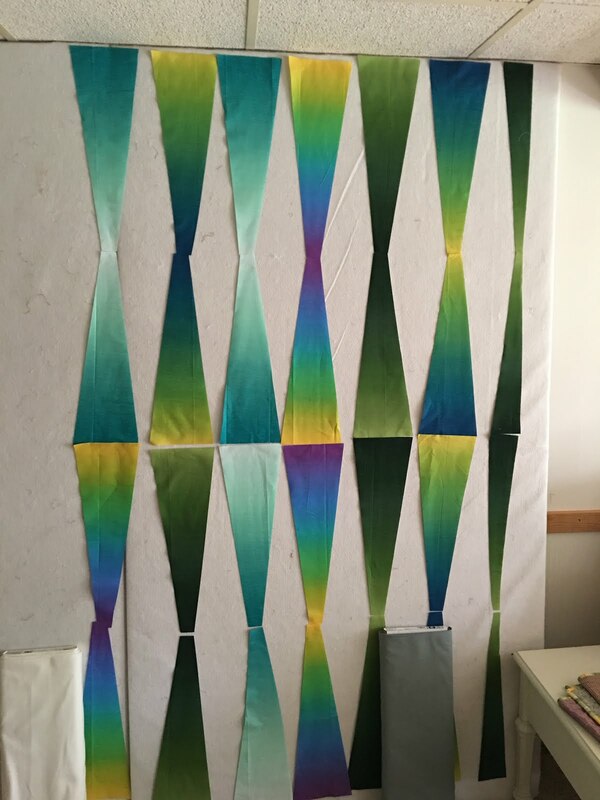 The math fabric is called Modern Background Paper Basic Metrics, by Zen Chic. I love all of the Zen Chic designs! 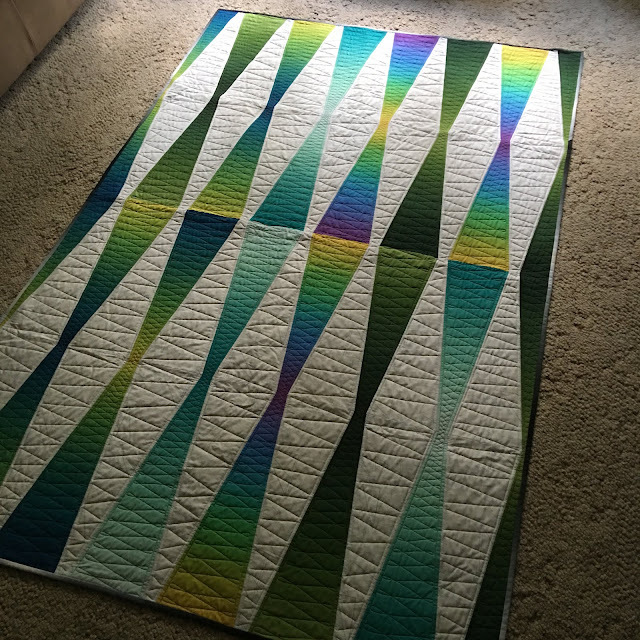 And yes, there were only 60 pieces total in this quilt, so it does go together fast. Thanks!